As we continue to go through our archives of past news articles on Jim Rielly, we will post them here. 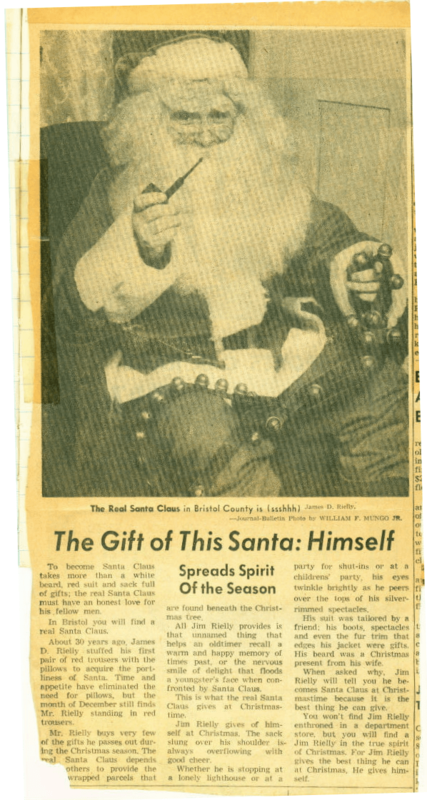 Yesterday, we came across this article from a December 1957 issue of the Providence Journal-Bulletin. To become Santa Claus takes more than a white beard, red suit and sack full of gifts; the real Santa Chars must have an honest love for his fellow men. In Bristol you will find a real Santa Claus. About 30 years ago, James D. Rielly stuffed his first pair of red trousers with the pillows to acquire the portliness of Santa. Time and appetite have eliminated the need for pillows, but the month of December still finds Mr. Rielly standing in red trousers. Mr. Rielly buys very few of the gifts he passes out during the Christmas season. The real Santa Claus depends on others to provide the gift-wrapped parcels that are found beneath the Christmas tree. All Jim Rielly provides is that unnamed thing that helps an oldtimer recall a warm and happy memory of times past, or the nervous smile of delight that floods a youngster’s face when confronted by Santa Claus. This is what the real Santa Claus gives at Christmas-time. Jim Rielly gives of himself at Christmas. The sack slung over his shoulder is always overflowing with good cheer. Whether he is stopping at a lonely lighthouse or at a party for shut-ins or at a children’s party, his eyes twinkle brightly as he peers over the tops of his silver rimmed spectacles. His suit was tailored by a friend; his boots, spectacles and even the fur trim that edges his jacket were gifts. His beard was a Christmas present from his wife. When asked why, Jim Rielly will tell you he becomes Santa Claus at Christmastime because it is the best thing he can give. You won’t find Jim Rielly enthroned in a department store, but you will find a Jim Rielly in the true spirit of Christmas. For Jim Rielly gives the best thing he can at Christmas. He gives himself. What are your memories of Jim Rielly? Please share them. We would love to hear from you!